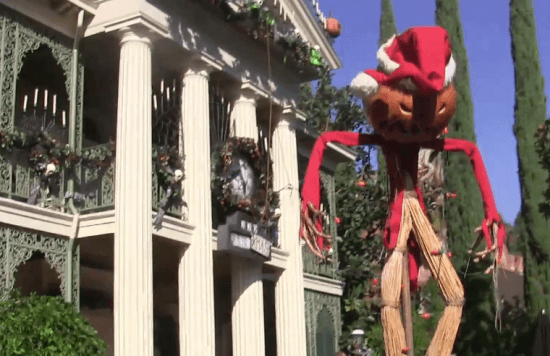 As Halloween Time begins at Disneyland, Jack Skellington once again descends upon The Haunted Mansion, making it over into Haunted Mansion Holiday. This year’s version is largely the same as 2013, featuring the same projection upgrades and other special effects. But for 2014 there is a spooky new zombie gingerbread house in the ballroom. The full experience can be seen in the ride through video below, courtesy of Shawn Marshall at The Confluence Covers. In addition to Haunted Mansion Holiday, Halloween Time brings more fun Fall entertainment to Disneyland including a new Mask-A-Rade show in the Big Thunder Ranch Halloween Carnival, where Billy Hill and the Hillbillies used to perform. Check out The Confluence Covers’ YouTube channel for many more videos from Disneyland’s Halloween Time 2014.